The Nail Shop is a relatively new London based record label established in 2016 but only releasing their first two EPs in 2017. As their name implies, cheeky references to manis and pedis are regularly found but the real focus is on the music. Showcasing impeccable A&R skills from the get-go, they’ve managed to release polished sounding records from Speed Boat (one half of New Zealand duo, Sandboards) and Maniqin, both solo debuts for the artists in question. Although their sound is as of yet hard to pin down, it’s clear that there is a heavy focus on the dancefloor, with both records undeniably causing some ruckus and already being championed by some leading influencers. The Nail Shop’s third EP is set to hit shelves soon and once again comes from New Zealand. 2XM (soundcloud) are Liam and Benjamin Murray or 2 x Murrays. Although this is not quite a debut release for them, they’re still relatively unknown with a number of self-released titles and a mellow sounding track out on Dream Raw Recordings, evidence of the label’s knack for spotting talent early on display once again. The “Rendezvous” EP, named after arguably the most club-worthy track of the bunch, is a mix of mellow sounds and dancefloor friendly cuts with jazzy influences aplenty. Our premiere and the A1, 2AM leans towards the latter, although still easy to listen to we can easily see it dealing some damage with footwork friendly rhythms, anticipatory buildups and breaks, mesmerizing keys and a perfectly groovy bassline. 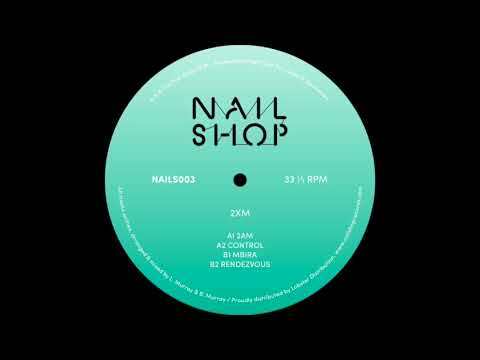 If the Nail Shop isn’t on your radar yet you should consider keeping a close eye on them as well as 2XM and don’t forget to pre-order this release which is set to be out February 23rd.